Minimalist shoes took off in popularity after the introduction of Vibram FiveFinger shoes. Some people don’t like how FiveFinger shoes look. So other companies have started making great minimalist shoes for every day. While there’s still a lack of good minimalist dress shoes for women, there are plenty of attractive casual shoes for your everyday needs. Men can choose minimalist shoes that look great at work and at play. All these shoes feature the great benefits of minimalist shoes. For those who swear by barefoot technology, these casual shoes are going to thrill you. Bring your minimalist shoes into your everyday experience. Your feet will thank you. Are you looking for a casual summer shoe that has style and practicality? Even if you’re not a sailor, the Xero Shoes’ Boaty minimalist shoe is a good option. Like the popular Sperry’s, the Boaty is a men’s slip-on shoe made for boat decks. Most men who don’t sail use them as casual house shoes or for summer activities. These minimalist shoes are made from canvas on the top, so you won’t have to worry about weather conditions. There’s even a moisture-wicking lining so you don’t have to worry about feeling sweaty in the summer-time. Boat shoes are already made to have lots of room in the toes. The biggest difference between these and normal boat shoes are the soles. Xero Shoes developed their Pro5 soles while pitching their DIY sandals on Shark Tank. These soles are durable rubber, only about 5mm thick. This gives your feet protection while still allowing you to feel the texture of the ground. Xero’s Boaty is the minimalist alternative to popular Sperry’s. You’ll still be stylish, but your feet will feel better at the end of the day. Some casual shoes straddle the line between casual and dressy. You can wear them to a business casual workplace, and still, take them out for drinks with friends. Vivobarefoot’s RA II Men’s Casual Leather Lace Up is that kind of shoe. The 100% hand finished leather top is made from Wild Hide. Polish it up for work, or keep it casual. These shoes were created so you can wear them without socks. If you’re worried about nasty foot odor, you can put in the removable 3mm cork lining. Cork will keep your feet warm in cold weather and has natural anti-microbial features. Vivobarefoot’s minimalist shoes don’t have any arch support. You can adjust the midsole support by tightening the laces. It won’t be as supportive as some of their athletic shoes, but it’s still nice to have. The best thing about these casual work shoes is the construction. The toe box is nice and wide, so your feet can move around the way they need to. The sole Is ultra-thin, so you’ll feel everything while you’re walking with friends. The zero-drop sole also corrects your posture and helps ease the pressure on your joints. If you want shoes that transfer from work to play, check out the RA II Men’s Casual Leather Lace Up. Spray them with a weather-resistant spray to protect the leather from rain or water. These last two casual minimalist shoes are boots. They’re constructed with different purposes in mind because not all boots are equal. The first up is Xero Shoes Coalton. They’re a men’s chukka style boot, with a zero-drop heel and two different colors. First, this boot has the same hallmarks of other Xero shoes. The sole is ultra-thin, puncture resistant, and has some light grips for better tread. Xero suggests that you can take these shoes out every day, or use them for hiking. The straps also feature the same V-shaped strap that tightens the midsole and heel. If you’re easing into a full-time minimalist shoe life, these straps will give you more control over the fit. The inside has a wide toe box, so even wide feet can let their toes spread out. The sole isn’t elevated, which encourages your foot to strike the ground with the midsole. This improves your posture and reduces the impact on your joints. One of the nicer things about this insole is the supple leather lining. It molds to your feet over time, improving the comfort level of the Coalton. The leather top of the shoe will also mold to your feet with wear. The texture of the leather is more suede than polished, so you won’t be able to wear these to work. But if you’re used to more casual dress, these boots could be a good addition to your closet. Vivobarefoot Gobi II Men’s classic desert boot is the sleeker of these two boots. Vivobarefoot says you can wear these shoes in nature, but the shoe also brings barefoot technology to your everyday. With that in mind, they’re definitely more street shoes than adventures shoes. These shoes are like the women’s Gobi II desert shoes in many ways. The sole is the same textured rubber with puncture resistant technology. It also has a leather footbed like Xero Shoe’s Coalton, but also comes with a removable cork insole. The cork adds warmth and fights foot odor. While the Vivobarefoot Gobi II excels in looks, it lacks in lacing control. Unlike the Coalton, you only have a three-eyelet lace system. It will give you some control over the tightness around your ankles, but won’t help you much with arch control. One nice thing about the Gobi II are the different materials you can get them in. They come in Wild Hide leather or canvas. The leather has more durability, but you’ll need to treat it for it to be waterproof. Canvas won’t have these problems, but it won’t look as sleek either. If you’re looking for a minimalist street boot, the Gobi II is a great choice. 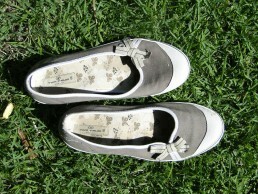 Looking for a cute and casual minimalist shoe? The Vivobarefoot Women’s Primus Lux Everday Trainer is your best friend. These shoes come in great neutral colors, plus the popular burgundy that’s big in the fall. You can wear them with jeans, leggings, or whatever you feel like. They look like most neutral sneakers but have all the benefits of a minimalist shoe. The first thing to know about the Primus Lux is that it’s top is made of imported leather. This ensures that you’ll not only look good, but the shoe will hold up to anything you throw at it. Speaking of throwing, you can fold these sneakers up and throw them in your purse. They weigh about a pound each, so they won’t drag you down during the day. After work, slip these on for instant relief. You don’t even need socks, because Vivobarefoot creates shoes that don’t need socks. The rubber sole is the standard Pro5 material that’s puncture resistant. If you decide to take a stroll or brisk jog, your feet are protected from any debris. It’s also super thin, so you’ll be able to feel any surface you’re on. If you’re not already aware, minimalist shoes do not have any arch support. They’re created with the idea that we’re born without arch support, so we don’t need any. If you’re worried about arch support or want an extra cushion, the removable insole will help you adjust. Vivobarefoot’s Women’s Primus Lux is a great casual shoe for any athleisure fan. When fall and winter roll around, one of the first things you do is abandon your cute sneakers for some great boots. Luckily for you, minimalist shoe companies have started branching out into street-ready footwear. Xero Shoe’s Vienna Boot, their take on the Chelsea ankle boot, is a great example. The cotton canvas top is great for winter travel. The synthetic toe-caps and ankle accents are 100% vegan-friendly. They look good, and they’re good for the environment. The elastic siding makes slipping these shoes on and off very easy, something you’ll want when you’re standing in the doorway trying to dust off the snow. As for the barefoot construction, Xero Shoes uses their FeelTrue sole to get you closer to the ground. There’s no heel, so everything is Zero-Drop. This will help with your posture and balance. The toe box is wide enough to allow your foot to splay on the ground the way you’re meant to do. The sole itself is 5mm thick, and it has enough tread to keep you on your feet. You can wear these shoes with socks or without, depending on your comfort level. The Vienna Canvas Ankle boot is wonderful for your fall and winter wardrobe, and you won’t have to sacrifice foot comfort. When Vivobarefoot decided to create a casual boot, they went for a classic minimalist design. Thus the Vibobarefoot Gobi II is a sleek, stylish addition to the casual boot wardrobe. The Gobi II Classic Desert Boot is like the men’s counterpart. It’s top is 100% Wild Hide leather with a three eyelet lace design. The lacing of these shoes doesn’t give you the same control over your midfoot and heel as hiking shoes. But it does allow for a more snug fit around the ankle. The sole of the shoe is the same Pro5 construction as the Primus Lux shoe, so you’ll still have puncture protection. The sole has minimal traction, so save this great shoe for your everyday adventures. Like other minimalist shoes, the Gobi II Women’s Desert Boot has a wide toe box and no arch support. You can wear these with socks or without. If you’re getting used to minimalist shoes, socks can help cushion the blow. There’s also a removable cork insert for extra warmth and comfort. The anti-microbial elements of cork will also protect against foot odor. These shoes are 100% leather, so spray them with a weather-proof coating if you live in rainy places. By doing this, you’ll help the shoes last longer and protect against stains. The Gobi II Women’s Classic Desert Boot is a sleek addition to your shoe collection. It’s not as weather resistant as the Xero Vienna, but you can change that with weather-proof spray. If you’ve been on the Internet at all in the last few years, you’ve seen wool sneakers. More companies are using wool to create the upper parts of their sneakers. They do this because wool is moisture wicking, good for insulation, and vegan. Wool also has anti-microbial features that help protect against foot odor. Wool is also super light, which makes it the perfect material for minimalist shoes. That’s what Xero Shoes had in mind when they created their casual wool sneaker, the Pacifica. Pacifica is one of the few minimalist wool shoes on the market (although they might not be for long). Beyond the great benefits of wool, it’s also a well-constructed minimalist shoe. It also has a cool v-strap system that lets you adjust the heel and midsole tightness of your shoes. This allows for a perfect fit, even if you’re new to the minimalist shoe scene. Xero Shoes’ Pacifica also has the wide toe box and zero-drop sole that are a staple of a minimalist shoe. If you’re curious to try out the wool shoe trend but don’t want to sacrifice foot feel, the Pacifica should be your next buy.